THE NEW ORLEANS JAZZ BANDITS will be making their first appearance here on Friday, 24th AUGUST 2018, although most of the band members have appeared here many times before. Some are even old hands – going back to our Badger’s Mount Hotel Jazz Club days – as does Malc, who played with Phil Mason (featured in our club poster). So, now to fill you in with the band member’s. 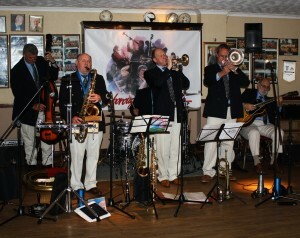 Well, to start with, we have ALLEN BEECHEY on trumpet, RON RUMBOL on clarinet &alto sax and JOHN FINCH on trombone, with the engine boys being MALC MURPHEY on drums, PETER BROOKS on double bass and PAUL SEELEY on banjo. They are sure to give you a super evening’s entertainment, so dont miss out. 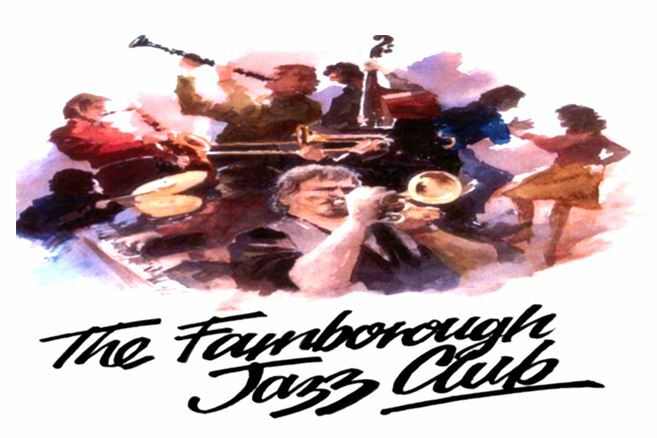 They fare from all over the country – Essex, Bracknell, Surrey, Berkshire, Cheshire and Chelsea … yes, one of those bands that are mad … nice though, that they wish to come to our Farnborough Jazz Club here in Kent. Dont forget, THIS August Bank Holiday weekend, brings you our ‘4-In-A-Bar+1’ Sunday gig at Ye Old Whyte Lyon Pub (in Locks Bottom, BR6 7BA) to you. It is a special one, with our playing time being 2-4pm (Not our usual 3-6pm). Note: last order for lunch is at 2pm. Then, a 4,or4.30pm bar-b-que and then the popular rock band ‘Kristian Baker Band’ will be playing in the lovely pub garden for you at 4.30pm – till late. 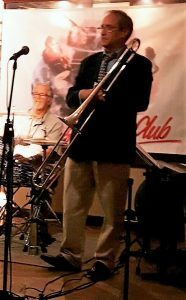 This entry was posted in New Orleans Jazz Bandits on August 23, 2018 by Diane. MIKE BARRY’S UPTOWN GANG will be playing for you tonight, Friday, 17th August 2018, here at our FARNBOROUGH JAZZ CLUB (Kent). Last time Mike’s ‘Uptown’ band was here, he had fallen, and his injuries had meant he was unable to play, but he is back tonight. Band leader, MIKE will be joined by GOFF DUBBER on reeds, ‘WHISPERING’ MIKE HOLT on trombone & vocals, JOHN SMITH on banjo & guitar, ROGER CURPHY on double bass and GRAHAM COLLICOTT on drums. Also, their last appearance (in March 2018), I was apologising to you all about cancelling the previous week, having only had to do so twice in nearly 30years (and always due to extreme bad weather – being snowed out of the club!). So quite weird that we have had the hottest (probably the longest) summer ever recorded too aye! It was nice to see a decent crowd here last week, so please see if you can come again tonight. By the way, we are offering free entry for 25year-olds and under for a limited period (please bring proof of age, so you don’t make it difficult for me, thanks ). I promise you wont have to kiss me! This entry was posted in Mike Barry's Uptown Gang on August 17, 2018 by Diane.